I wasn’t surprised one bit when I read that many consider “Citizen Kane” as the best film ever made. Afterall, The American Film institute called it the greatest movie of all time back in 1998. “Citizen Kane” is indeed one of those ageless movies that get better with repeated viewings, and through the years, it has become one of my personal favorites. The legend of this movie has been partly fueled by the fact that Orson Welles was only 24 when he made it, but also from the obvious comparisons between the main character Charles Foster Kane, and real life newspaper magnet William Randolph, who did everything possible to stop the picture from being released (when that failed, he tried to discredit it). 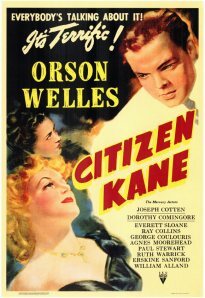 “Citizen Kane” tells a fantastic story in reverse: Charles Kane (wonderfully played by Welles himself) is born poor, but was adopted by a rich man when he was only a child. As a young man, he begins to assemble a newspaper and radio empire, before marrying the niece of an American president. But as Kane becomes more and more alienated from his power, he becomes abusive to the women in his life, first his wife, then his mistress. When he dies, Kane had spent most of his final years in his unfinished castle, longing for the simplicity of his childhood. The most important reason to why this film was regarded the way it was, was due to its technical and stylistic innovations. It’s obvious that Welles was 20 years ahead of his time when he made this groundbreaking picture. Audiences and critics could not grasp many of its elements, and I don’t blame them. It was only after so many years that “Citizen Kane” became the film that we know and admire today, and it has served as a benchmark and source of inspiration to the film-makers of different era. There’s no denying that from the opening scene to the closing sequence, “Citizen Kane” is one unforgettable ride, and will always remain the movie that made me realise how much classic movies should be cherished and treasured. 4/4??? fi hek shi :p then it’s a “must watch” movie! haha yes citzen kane is a classic! Akid 4/4 :p I hope u get to be blog of the week btw!